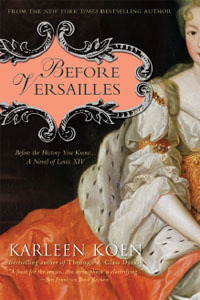 Karleen Koen's latest novel, a celebration of France's vibrant, young Louis XIV before he became the icon of the seventeenth century. Louis XIV is one of the best-known monarchs ever to grace the French throne. But what was he like as a young man — the man before Versailles? After the death of his prime minister, Cardinal Mazarin, twenty-two-year-old Louis steps into governing France. He's still a young man who, as king, willfully takes everything he can get — including his brother's wife. As the love affair between Louis and Princess Henriette burns, it sets the kingdom on the road toward unmistakable scandal and conflict with the Vatican. "This is a powerful rich telling of a few months in the life of King Louis XIV." Romance Reviews; Historical Novel Society Editors' Pick. A big story about Louis XIV has been brewing since my second novel. A piece of all that intrigued me was used in Dark Angels. Here is another piece of the immense story that is his life.